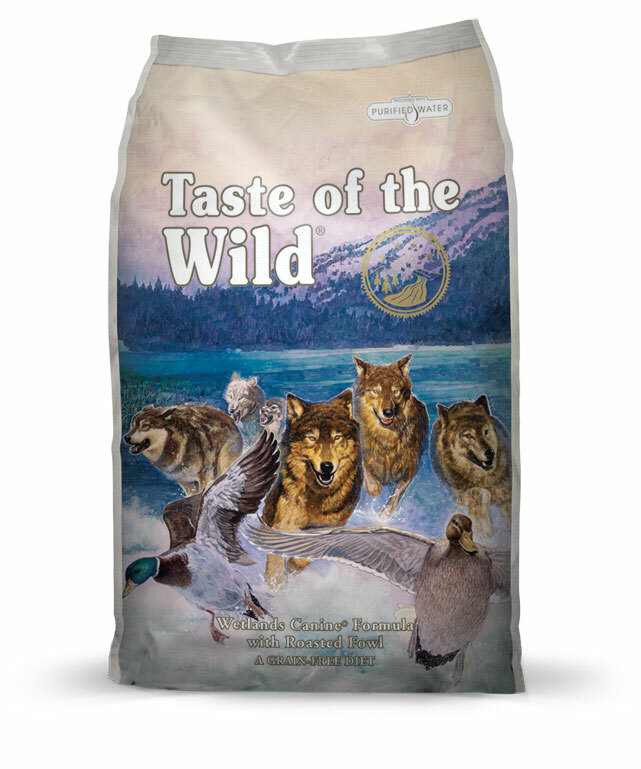 Taste of the wild Wetlands Canine Recipe is formulated to meet the nutritional levels established by the AAFCO Dog Food Nutrient Profiles for maintenance. With 32% protein, this formula is packed with highly digestible energy from duck, quail and turkey, along with nutrient-packed vegetables, legumes and fruits. This unique combination of fowl gives dogs the taste of wild game they can’t resist with the balanced nutrition nature intended. Roasted Quail, Roasted Duck & Smoked Turkey – This trio of richly flavored fowl provides highly digestible protein and a great taste your dog will crave. Protein Blend for Optimal Nutrition – Multiple protein sources ensure that adequate amounts of the building blocks for a healthy body are available to meet your dog’s needs. Ingredients - Duck (12.5%), duck meal (12.5%), Chicken Meal (12.5%), sweet potatoes, peas, potatoes, chicken fat (preserved with mixed tocopherols), egg product, ocean fish meal, potato protein, roasted quail (1%), roasted duck (1%),smoked turkey (1%), tomato pomace, minerals, dired chicory root, tomatoes, blueberries, raspberries, yucca schidigera extract.